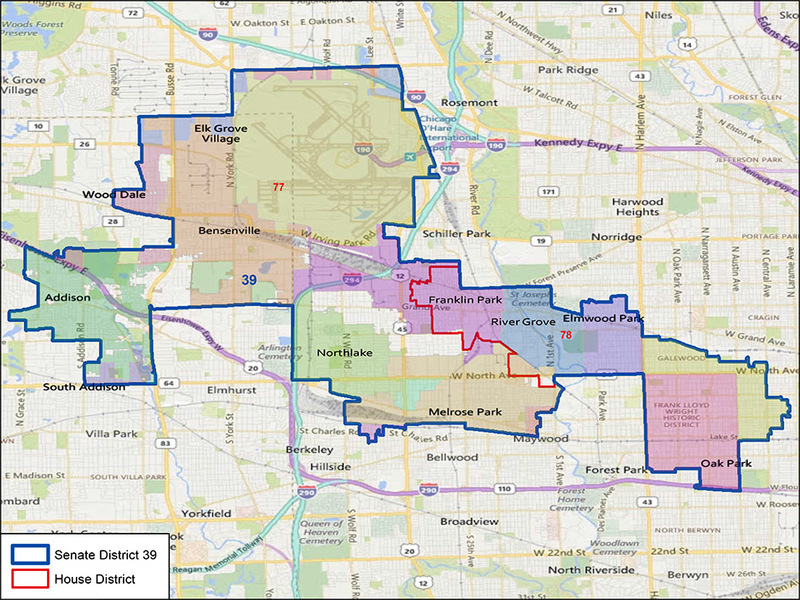 The 39th Legislative District includes Oak Park, much of the Austin and Galewood neighborhoods in the City of Chicago (including parts of the 29th and 37th Wards), Addison, Bensenville, Elmwood Park, Franklin Park, Melrose Park, Northlake, River Grove, Rosemont, Stone Park and Wood Dale. The 39th Legislative District includes both the 77th and 78th House Districts. The 77th House District is represented by Rep. Kathleen Willis (D - Addison). The 78th House District is represented by Rep. Camille Lilly (D - Chicago).